After my caulk and patches sat for 24 hours I gave all the planks a gentle sanding with an electric sander and 150 grit sandpaper. I wore my mask for this. Again, miserable, but sawdust got EVERYWHERE and I felt no need to introduce that stuff into my lungs as they healed from a summer cold. 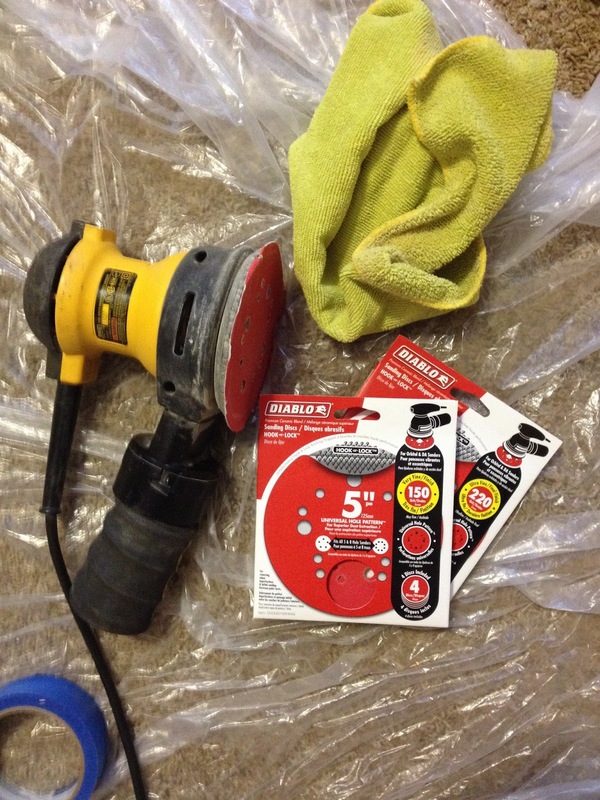 Also, my dad put The Fear of the Sander in me when he was giving me my power tool demonstration. At the time it didn't even have any actual sandpaper on it (just the velcro pad) and it easily took a corner off a plastic tub in their garage. He said, "Imagine that's your knuckle." No thank you. 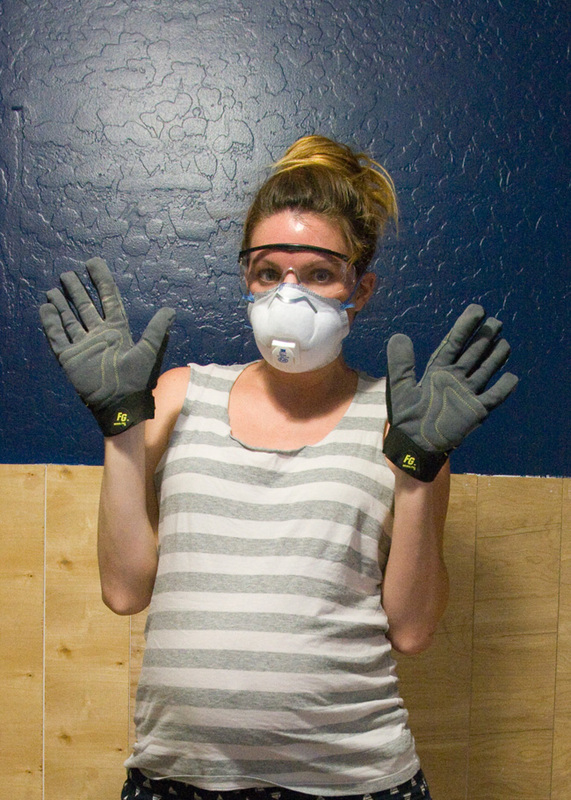 I wore Aaron's heavy-duty gardening gloves every time I used the sander and came out mercifully unscathed. After sanding I vacuumed the crevices then wiped down the walls with a damp rag to remove any sawdust. 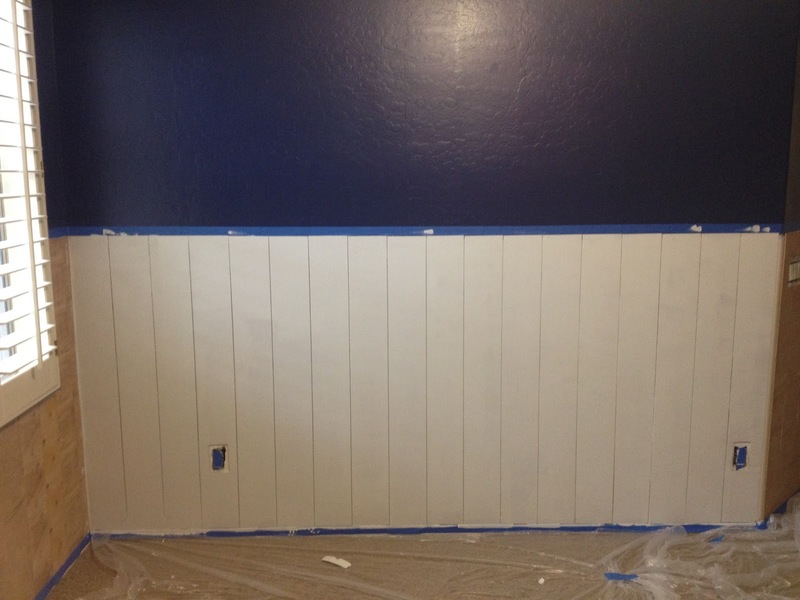 Then I taped, and got to priming! Finally! 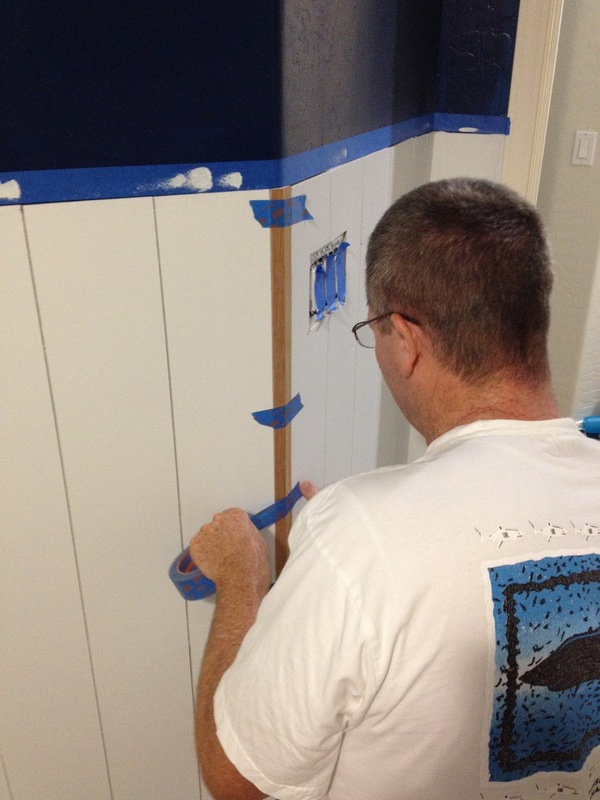 I felt like getting the tape up where the chair rail would eventually go helped me to finally see the end goal. Up until this point I had sort of been questioning my decision! I felt even better once I got one wall primed. Hallelujah this just might work. I primed all the boards and then had to walk away for a weekend (plans, etc.) but came back a few days later and gave the priming another gentle sanding and wiping down. 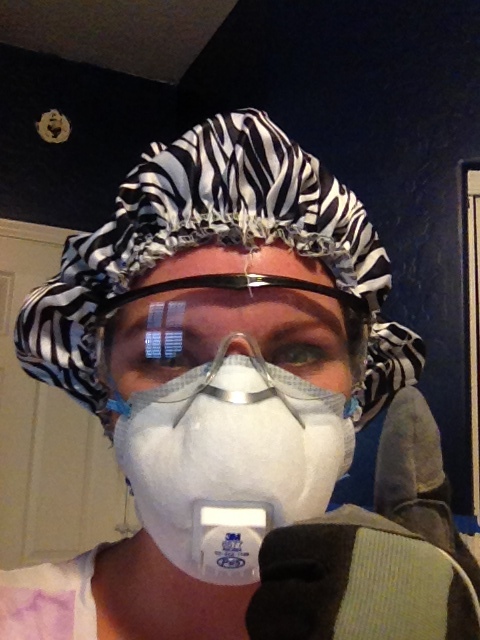 I learned from my previous sanding experience that I would end up with stuff coating my person. Since I had recently washed my hair I added a shower cap. I rolled on a second coat of primer. Then I switched to 220 grit sandpaper and gave it another sanding. 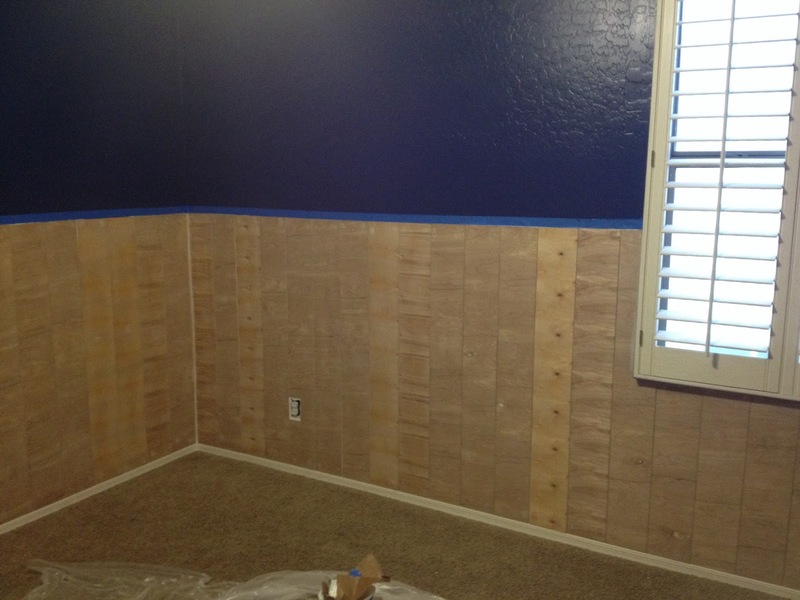 He used more of the 5mm underlayment and just caulked it into place once the pieces were cut. After the caulk dried I ground it down with the sander to give a more rounded edge then primed to match the rest of the planking. I gave the planking one more really good wipe down with a damp rag because it was PAINTING TIME HALLELUJAH. 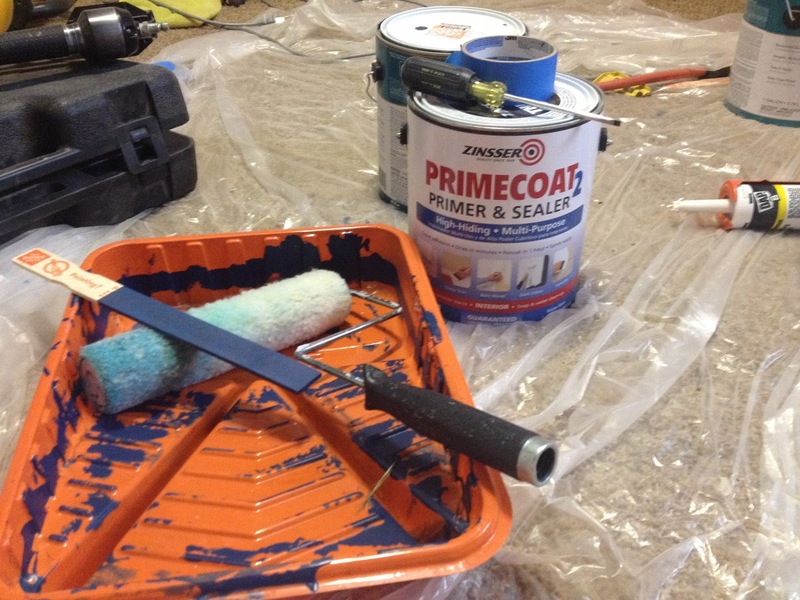 I agonized over my paint options (is there really a difference in quality between brands? What about rollers?) but it was this post from Vintage Revivals that finally convinced me to shell out for Sherwin Williams paint. I put a lot of time and energy into this project and we are going to live here for a while so I really wanted the paint to look awesome and be durable. I color matched to my existing trim and crossed my fingers. I say this as a totally unsponsored statement: I am a convert to Sherwin Williams. The cheap paint I used under the planks gave crap coverage. After 2 coats I had gone through most of the gallon and would have had to go buy another gallon and roll on at least one more coat to get full coverage. The Sherwin Williams Pro Classic paint went on like a DREAM. I probably could have gotten away with one coat but I did two and still had a half gallon left with which to paint my trim a few days later. It was AMAZING. Lesson learned. Also: painting my 6 inch planks with a 6 inch roller was extremely satisfying. It felt so very orderly. So there's that. 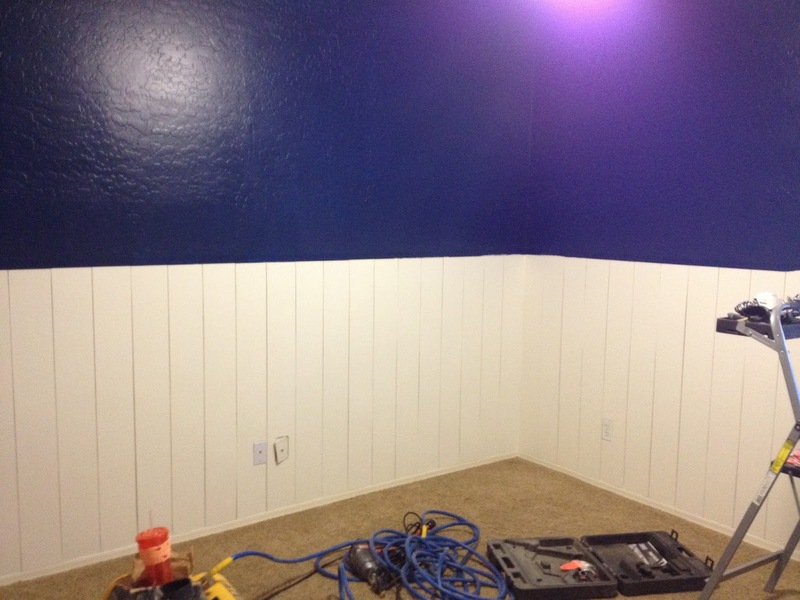 I did one coat and by the time I got back to my starting place the paint was already dry. So I just went around again. It's possible that I should have sanded but by that point I was all sanded out. I don't think my paint job is any worse for the wear because of it. 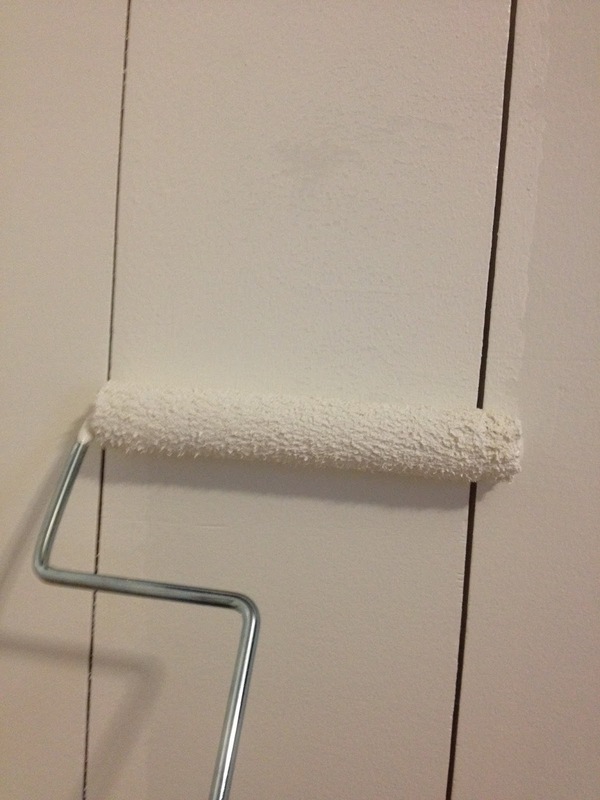 The paint likes to bubble a bit between the planks. 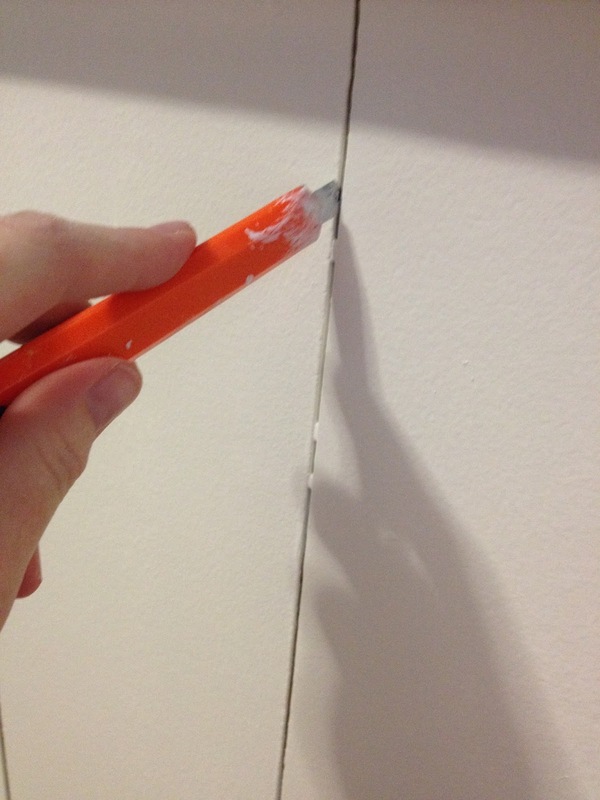 I took a cheap x-acto knife and swiped it through to remove any paint. After the planks dried I went around and gave everything a general wipe down (sawdust. everywhere). And then I pulled up all the plastic and dared to dream that someday, eventually, I would be finished. These posts are so fun! It's great to see the improvement and do none of the work :) Also, thank you for being a fashion blogger who's not afraid to wear a shower cap and raggedy clothes (you know, clothes people would actually paint in). It makes me happy. Such a fun project! I'm enjoying following along. I always use Behr paint & primer in one. For walls I use satin finish & for furniture I use eggshell. I've done my whole house in this, plus multiple pieces of furniture & have never had to do more than one coat! It's awesome.